The air-conditioned restaurant at the Hotel Atlas has a wonderful view of the coastline and the surrounding gardens. The terrace is perfect for outdoor diningoverlooking the shoreline. 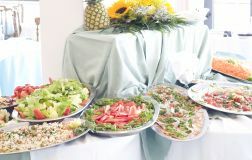 There is a rich breakfast buffet and the table service at lunch and dinner is also accompanied by a generous buffet. selection of warm side dishes, salads, cold meats, and a choice of starters and fish dishes. 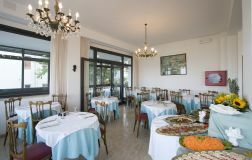 The Breakfast Buffet includes warm, home made pastries and cakes. The restaurant cuisine includes vegetarian dishes and dishes suitable for coeliacs. Special attention is paid to dishes for babies and small children including pasta, vegetable broths, meat and fish. High chairs are available for children. Come to lunch straight from the beach or swimming pool andas soon as your meal is over return there for the afternoon. In the evening you can sit back and enjoy a unique, candlelit, dining experience. Questa è davvero una vacanza rilassante!